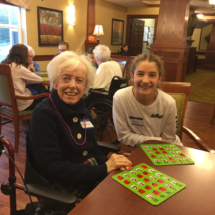 We had a busy month at Lilydale Senior Living! 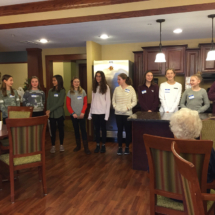 We enjoyed January visits from both the Cretin Derham Hall hockey team and 6th graders from Faithful Shepherd Catholic School. Check out photos from both visits. 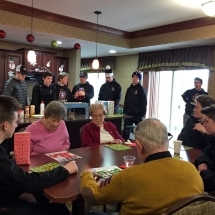 The Cretin Derham Hall Hockey team joined the tenants at Lilydale Senior Living for ice cream sundaes and bingo. 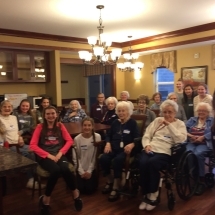 Lilydale Senior Living tenant, George Rumsey, graduated from Cretin Derham Hall High School in 1942. He was a goalie for the hockey team for two years and lettered in both hockey and baseball. It was a fun afternoon for all! 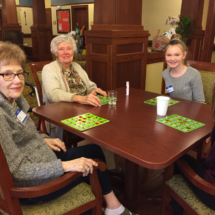 6th graders from Faithful Shepherd Catholic School in Eagan spent an afternoon at Lilydale Senior Living playing bingo and singing. It was a joyful day!